Question: What makes tire workouts so effective? I did a tire workout last week and it nearly beat me, but other than just exhausting me, how is flipping or rolling a tire going to help me in football? Answer: It depends on the size of the tire, and the tire size should be appropriate for the individual training with it. The training itself should stimulate, not annihilate, but it should be very challenging. 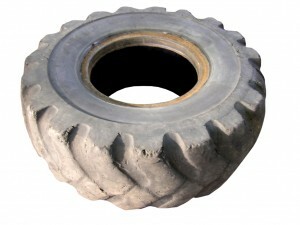 Tires, especially for linemen, are strikingly similar to what they need to do well on the football field. Begin with a low stance, explode upward through the hips and forward, drive through the movement and step forward. This combination of actions simulates blocking and pushing opposing players. Tire-flipping engages every muscle, and it is typically done in sets of five reps. Rest 15 seconds, repeat other five flips. Flip the tire 15 times, which is approximately 40 yards. That is immediately followed by 10 jumps into the tire and out. Then, place your feet on the tire and do 10 elevated push-ups. Sprint back to the starting point, 40 yards, grab the handle of the drag sled loaded with 135 pounds and pull it backwards for 40 yards. Sprint back to the starting point. Typically, we do four rounds and attempt to complete them all within 20 minutes. It’s one routine that will leave you struggling to complete it within the allotted time, especially the first time doing it. But with proper recovery it conditions you very quickly. Tire-rolling is a another thing entirely. There have been trainers who add dumbbells inside the tire and roll the tire, but it doesn’t produce explosiveness and the dumbbells can shift to produce their own momentum if they stay within the tire. Flipping tires combines deadlifts, cleans and push presses. Those translate better to the athletic fields than rolling.